What a wonderful collection of wonderful songs. Swedish publisher Malört invited eleven very different artists to write and play music inspired by one of the most fascinating of all mythological creatures: The werewolf. 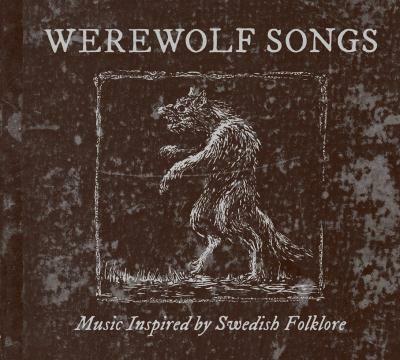 The compilation „Werewolf Songs – Music Inspired by Swedish Folklore“ combines both new songs and interpretations of traditional folk tunes and – this makes the concept even more beautiful – is meant to serve as a soundtrack to, or rather, an aural interpretation of the book “Varulven i svensk folktradition” (“The werewolf in Swedish Folklore”) by Ella Odstedt. While some groups, like KORP, take a very traditional approach to the music, others went for more exotic or uncommon alternatives: Fursaxa’s “The Wolf Month” makes one think of shamans‘ chants echoing across vast and barren landscapes, and KTAOABC’s “Waltz for Wolves” sounds like a love declaration made on an old nighttime funfair. Hexvessel, one of the brightest stars in the sky of unusual and beautiful music, contribute their gentle and unmistakeably hexvessel-ish ballad “Vainolainen”. Most songs verge on the edge of being haunting and unsettling, telling stories of creatures torn between two worlds. There is little that doesn’t please the ear: Faun Fables’ contribution „A Fearful Name“ can’t really keep up with the rest of the songs, being too fickle in its moods and too little powerful to actually convey the creepy atmosphere of its own lyrics, and Ulvens Döttra unfortunately have a weakness for kitschy choirs. I also missed some additional information about the artists and their origin. Anyhow – if you need a break from amplified music, go for this one. It’s the beauty of the beast captured on CD.